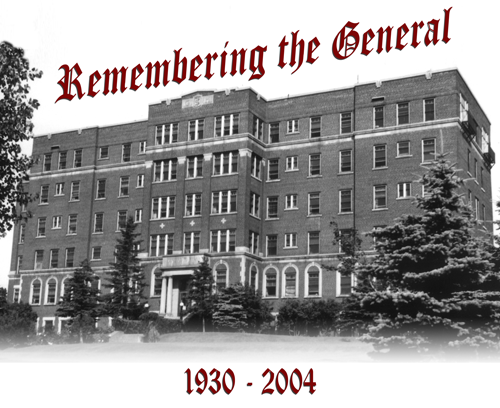 Built between 1928 and 1930, the General Hospital of Port Arthur served the people of Port Arthur and Thunder Bay for over 74 years, until the Thunder Bay Regional Health Sciences Centre was completed in 2004. Of the three hospitals in existence when the TBRHSC was commissioned, only the General was completely demolished, thereby leaving nothing to commemorate its role in the history of healthcare in our community. Click here to read a brief history of the PAGH. Memorable facets of the General were three stone blocks on the upper façade depicting the Rod of Asclepius, neighboured on either side by a large G and H. These blocks have been saved in pristine condition, and with your help they will stand on the Health Sciences Centre grounds as a monument to the history of the General Hospital of Port Arthur and all that it did for our city. Join us in Remembering the General. Help our group of dedicated citizens build a monument to forever honour and remember the General and the many men and women who devoted their lives to the management and everyday operations of this important part of our healthcare history.